Specific treatment of your fasia and muskular tension through higher trigger point decompression and the elastic surface stretch effect. 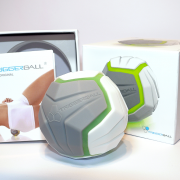 Its ergonomically optimized compressive strength adjusts comfortably to the natural tissue pressure of the human body. It leads intuitively to the right posture on a support edge. Its revolutionary effect on fascial stretching originates from the unique gel segments which are displaced evenly over the hardened inner sheath of the Triggerball. The hardened inner sheath which lies under the gel edges causes the specific decompression of the trigger points while imitating the therapeutically established pressure of the thumb applied by the therapist. 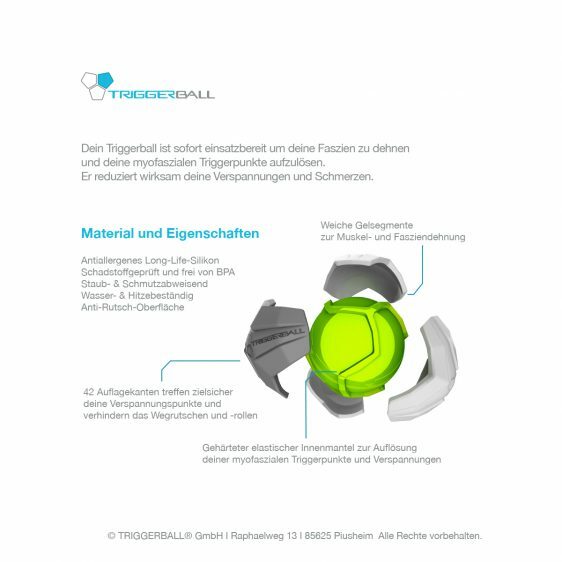 Triggerball consists of medicinal silicone, it is non-toxic and BPA-free, odorless and complies with all eligibility criteria for medical products. Its special surface is extremely dust- and dirt-repellent and of course water- and heat-reisistant, therefore a hassle-free cleaning is ensured. Long life silicone has the advantage of a high wear resistance. 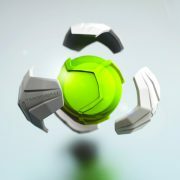 Its anti-slip surface, shape and color are extremely stable under normal use. The TRIGGERBALL® is the first High-End-Tool, developed for your self-treatment. It has been designed in Germany.